The island of Folegandros is connected to Athens and Piraeus with regular ferries and fast catamarans. During the off season there are two or three ferries per week that connect Folegadros to Athens. However, if you are flexible you can also find indirect routes via other bigger islands. During summer, there are one or two daily ferries and the ferry tickets are usually quite cheap for regular ferries and a bit more expensive for the catamarans. Folegandros belongs to the central Cyclades and is directly connected to Santorini, Naxos, Paros, Amorgos, Ios, Sikinos, and Anafi. There are also direct ferry connections to most of the islands of western Cyclades, as Milos, Sifnos, Serifos and Kimolos, as well as to Mykonos and Syros. As for making connections to other islands, Sifnos, Milos and the Western Cyclades are your best bet and Santorini, Sikinos, and Ios are good possibilities. But no need to worry about finding these info. Just check Ferryhopper and go! Looking for a quiet Greek Island where you can get away from package tours and holiday-makers? Folegandros may be just the place but you better hurry. The word is out. Folegandros has little in the way of package tourist amenities or major roads and those who come to the island looking for organized water-sports, discos and wild nightlife will be disappointed. But a lack of nightlife does not mean a lack of good restaurants and cafes for after all, on a quiet island, once you have walked through the hills in solitude, smelling the wild thyme, oregano and the array of colorful wildflowers in he spring, what better way to end the day than with a nice meal and some good wine? Like its neighbors Sifnos and Milos, Folegandros cuisine has not been gentrified yet. There are three main villages on the island Karavostasi, Hora (Folegandros town) and Ano Meria. 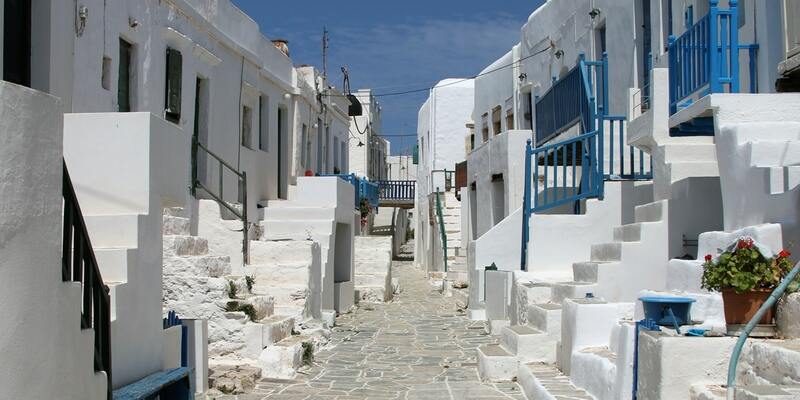 Hora is one of the oldest traditional medieval towns in the Cyclades; the buildings stand close to one another creating the external wall of the castle (kastro). The Hora, closed to car and motorcycle traffic, has a unique centre of three squares in a row, with trees under which to enjoy a drink or a bite to eat in a quiet, romanticatmosphere. It is no exaggeration to describe Hora as one of the most aesthetically picturesque, traditional villages of its kind. The view is said to be second only to that of Santorini, though fans of Plaka on the island of Milos might argue. The Kastro is a medieval fortress at the top of the town which dates from the 13th Century. Despite being a 'quiet island' there actually are some music bars so if you need that thumping beat to make conversation you are in luck. Karavostassis is a small seaside settlement 3 km southeast of Hora with whitewashed houses in the Cycladic style of architecture and a pebbled beach for nudists or not. Karavostassis is the island's port, where you will find fishing boats intermingled with and yachts and the visit of the ferry from Athens which comes only two or three times a week in the off-season. From Karavostassis, you can go on foot to Petoussis and Livadi to see the cave of Georgitsis. The rural village of Ano Merià with it's typical "kafeneio" and taverns, is spread over cultivated fields with a myriad of dry stoned walls. Here you will find the Ecological and Folklore Museum with exhibits that reconstruct the farming practices of the island. It includes a rural residence with out-buildings, an orchard and vineyard, utensils used in daily life, as well as local costumes. There are a variety of mostly quiet beaches around the island many of which require some hiking to get to. You can find some small beaches around the port area of Karavostasi. About 1 km from Karavostasi is the beaches of Vardia and Livadi with its beach and camping area. From Ano Meria you can walk from 40 to 90 minutes to reach many beaches, the finest being Agios Georgios, towards the northeast. From Hora a road heads north, hugging the cliff top and offeringbreathtaking views before descending sharply to the lovely sandy beach of Vathi Bay and the beaches of Angali and Agios Nikolaos. You can find more details in Matt's page for Folegandros.